October 26th is the day the Church remembers Alfred, King and Scholar who founded places of learning, translated Boethius’ consolation of philosophy and strove to preserve the Christian faith in the midst of the pagan Danish invasions. 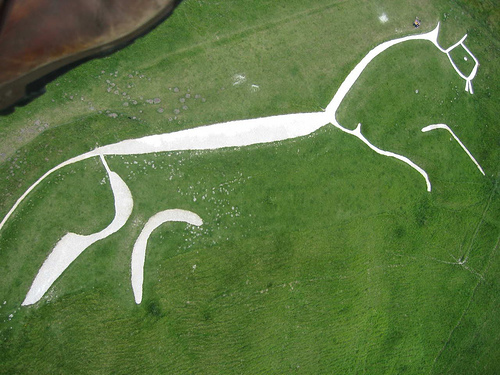 He is also the subject of GK Chesterton’s wonderful poem The Ballad of the White Horse. I recorded a reading of the whole poem back in 2011, on its 100th anniversary, and I thought I would repost it here, with links to the readings, in honour of Alfred’s day.This great poem is as much about modern times as it is a ballad of the days of King Alfred. In 1911 Chesterton foresaw that the modern Nihilism and worship of the ‘superman’ embodied in the writings of Nietzsche together with false worship of race and a cult of violence, would likey wreak unimaginable damage in the new century, as proved to be the case. He also saw that a renewal of the vision of joy and humility that is at the heart of the Christian creed was the only way to resist the death-wish which is the shadow side of our fallen humanity. He wrote a poem at whose heart is a call to courage kindled not by probable chances of success but by what he called ‘the joy without a cause’. Many Englishmen called to combat in the two world wars, went out with this poem in their pockets and were greatly strengthened by it. The Times quoted it twice in leaders each at key points in the second world war; “nought for your comfort” was the leader headline after the disaster of Crete and Alfred’s great cry ‘The high tide’ and the turn’ was the headline after the D Day landings. And yet this poem, once so centrally part of the national consciousness, is now hardly known at all or read, but its time must suely come again. Chesterton had a big influence on the Inklings, the writers who clustered around Tolkien and Lewis and there are a number of echoes between the Ballad of the White Horse and the Lord of the Rings. Especially the descriptions of Colan the Celt and his people, who, like the elves, are always haunted by the sound of the sea and have their hearts in an undying land. Likewise the detail of battle in which Alfred and his Celtic allies are sundered and the Celts, given up for lost, re-emerge as though they were the armies of the dead and put their foes to flight, that meeting on the field of battle against all odds is very like the events on the fields of the Pelanor. But perhaps the greatest similarity is in the ending of the two tales. In the final book of the Ballad, ‘The Scouring of the Horse’ Chesterton deals with the problem of the peace, the problem that after winning on the battle the wariors find corruption at home and have to confront evil in another form and in their own native place. Whilst Alfred leaves Wessex to confront the Danes in London the weeds are allowed to grow over the White Horse and at this point Chesterton gives Alfred a vision of the future and calls England to an eternal vigilance. I think the very namng, let alone the plot features, of Tolkien’s ‘Scouring of the Shire’ are derived from this. You can read and download the entire text of the poem here, though better still buy an old hardback copy. They are very cheap and still widely available. My reading of each of the episodes can be found through the links below and you will find, on my podomatic page, that I have also given a brief introduction to each book. I have left the settings so that the episodes can be downloaded, so you can listen to them off line or even, if you wish, burn them to a cd and use them to while away the hours on long car journeys! I hope you enjoy them, let me know what you think. In a previous post on the anniversary of 9/11 I read an extract from GK Chesterton‘s extraordinary Ballad of the White Horse, which seemed to me uncannily apt for the day. I have had a very positive response to that posting, so at the request of a number of people I have now made a recording of the entire poem which I have organised into 9 podcasts with links to all 9 episodes gathered onto this page. As I remarked on the 9/11 anniversary ,the poem, whose own 100th anniversary falls this year, is as much a poem about modern times as it is a ballad of the days of King Alfred. 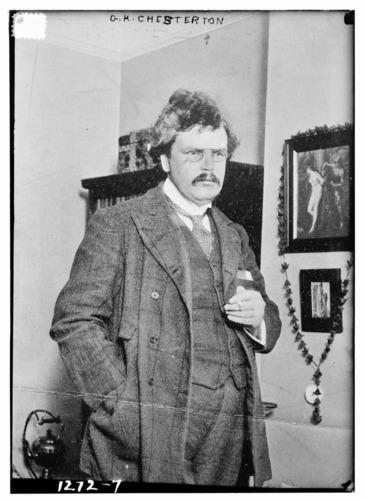 In 1911 Chesterton foresaw that the modern Nihilism and worship of the ‘superman’ embodied in the writings of Nietzsche together with false worship of race and a cult of violence, would likey wreak unimaginable damage in the new century, as proved to be the case. He also saw that a renewal of the vision of joy and humility that is at the heart of the Christian creed was the only way to resist the death-wish which is the shadow side of our fallen humanity. He wrote a poem at whose heart is a call to courage kindled not by probable chances of success but by what he called ‘the joy without a cause’. Many Englishmen called to combat in the two world wars, went out with this poem in their pockets and were greatly strengthened by it. The Times quoted it twice in leaders each at key points in the second world war; “nought for your comfort” was the leader headline after the disaster of Crete and Alfred’s great cry ‘The high tide’ and the turn’ was the headline after the D Day landings. And yet this poem, once so centrally part of the national consciousness, is now hardly known at all or read, but its time must suely come again. Chesterton had a big influence on the Inklings, the writers who clustered around Tolkien and Lewis and there are a number of echoes between the Ballad of the White Horse and the Lord of the Rings. Especially the descriptions of Colan the Celt and his people, who, like the elves, are always haunted by the sound of the sea and have their hearts in an undying land. Likewise the detail of battle in which Alfred and his Celtic allies are sundered and the Celts, given up for lost re-emerge as though they were the armies of the dead and put their foes to flight, that meeting on the field of battle against all odds is very like the events on the fields of the Pelanor. But perhaps the greatest similarity is in the ending of the two tales. In the final book of the Ballad, ‘The Scouring of the Horse’ Chesterton deals with the problem of the peace, the problem that after winning on the battle the wariors find corruption at home and have to confront evil in another form and in their own native place. Whilst Alfred leaves Wessex to confront the Danes in London the weeds are allowed to grow over the White Horse and at this point Chesterton gives Alfred a vision of the future and calls England to an eternal vigilance. I think the very namng, let alone the plot features, of Tolkien’s ‘Scouring of the Shire’ are derived from this.